Welcome to Linda Ikeji's Blog: The Olori who was brutally attacked by her deposed Deji of Akure husband has died. The Olori who was brutally attacked by her deposed Deji of Akure husband has died. 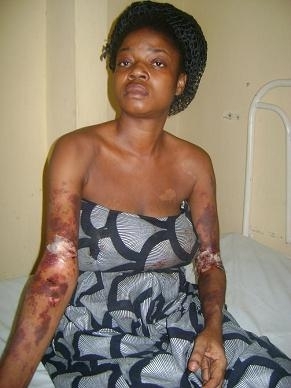 The Olori who was brutally attacked by her deposed Deji of Akure husband in 2010, has died. She died yesterday morning Tuesday June 12 at St. Mary Specialist Hospital, Ojodu, Ikeja. She was only 35 year old. Doctors say she died of cardiac arrest but family members say the late Olori had been receiving medical treatment from various hospitals since she was attacked by her husband who was then the traditional ruler of Akure on Sunday May 30, 2010. On Sunday May 30, 2010, the then Deji of Akure, Oluwadare Adesina Adepoju, along with his first wife and thugs, stormed the residence of the late Olori Bolanle, who was the second wife, and brutally attacked her. The deposed monarch allegedly ordered his thugs to beat up the late Olori and then they poured hot ashes mixed with something else, on her. Her cries attracted youths in the area who came to her rescue, but not before the thugs of the former Oba had inflicted permanent damage on her. 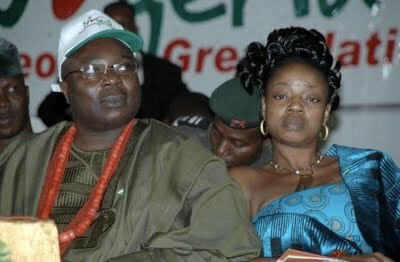 On June 10, 2010, the former traditional ruler was dethroned and banished by Akure Kingmakers for the attack on his wife. He's not been heard from since. A year later, Olori Bolanle is dead. Probably from injuries she suffered that day. Family members say she's been going in and out of hospital ever since the attack. May her soul rest in peace...amen. It's one death or the other everyday. Shocking! These spousal abuse has to be taken more seriously in our society as too many people are losing their lives needlessly. If she left him before the beatings became public. Our people will say a good woman stands by her man thru beating till death do them apart. yesco she left him already! he attacked her in her house with his latest wife if i may add! she was only 35??? sadly she looked much much older in the first picture. I doubt she was much happy in her marriage. Anon July 13, 2011 3:59 PM; his latest wife being Mrs Remi Abiola. She causes trouble wherever she is. Google her name please for her story. So sad and to think she forgave him for throwing acid or whatever on her. She was dealing with a principality and now she's dead. May she RIP. stupid yoruba men nah only woman dem fit beat cowards, long live biafra ! Wen war start dem go run go under bed.